What makes me confused is that when I convert my DVD to a video and watch it on my Macbook the quality gets bad. How should I do? Many people may complain with the bad quality after DVD conversion. Generally, an ordinary DVD movie is often 7-9 GB in size, if we convert it to an ordinary video format, the size would be hundreds of MB, so the code compress process would destroy most of unimportant data and the video quality gets bad. Why not ripping DVD to MKV which can decrease the damage and keep the high video quality? 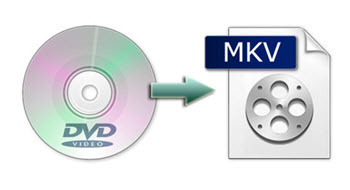 MKV is a new video container format that has many advantages over AVI or other formats. It has several new features like support of soft subtitles, variable framerate video and bitrate audio, plus B-frame compression. It aims to become the standard of multimedia container formats. And the size is often much bigger than common video and keep high quality. It is an envelope which can hold cahpters, DVD menus, audio, video and subtitle streams, allowing users to store a complete movie or CD in a single file. So many people would like to rip DVD to MKV format for flexible editing and watching. See MKV vs AVI, MKV vs MP4. MacX DVD Ripper Pro, a world-leading DVD to MKV ripper, offers the super-powerful functions to rip DVD full/main title to MKV format without the aid of any third party software. No matter it is the classic collection or the new DVD movies encrypted with Region Code 1-6, CSS, UOPs, Sony ARccOS, or Disney X-project protection, it can remove the encryption techs and make a digital copy of DVD movies, subtitles, videos and audio tracks to MKV with original quality, attributing to the advanced High Quality Engine and de-interlacing tech. On top of that, the whole DVD copy process is finished fast within 5 minutes only. Plus, this user-friendly interface makes it dead easy for both expert and newbie. The following step-by-step guide will show you how to backup full title DVD to MKV. Step 1. Load DVD Movies or DVD Folder. After free download DVD converter for Mac (Windows Version as well for PCs), launch it. Then click "DVD Disc" button to import the DVD file. You can also load DVD Video_TS folder by clicking "Path" button. Select the output video you desire. 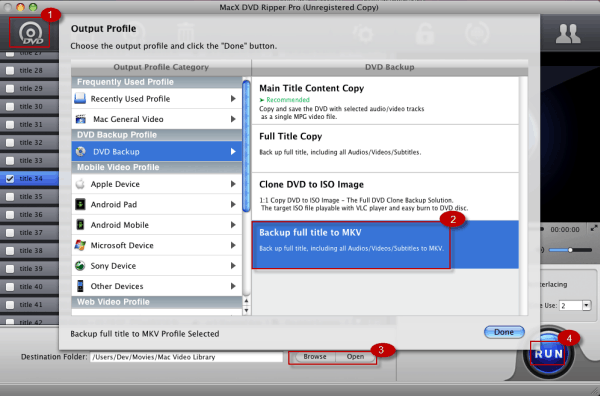 Go to DVD Backup Profile > choose "backup full title to MKV". All DVD titles, audio, video and subtitle tracks will be backed up onto your Mac hard drive in MKV format. Step 3: Select Output Folder. After finish the above steps, click the "RUN" button to start conversion, you could view the conversion progress and are able to cancel the converting process at anytime. Note: The best MKV DVD ripper for Mac also allows you to rip DVD to MP4, H.264, MOV, FLV, MPEG, AVI, QT(QuickTime) with high quality video/audio. The New-DVD-Backup feature let you copy DVD to single video file with original video quality and 5.1-channles AC3/DTS Dolby audio. After you have ripped DVD to MKV, you can of course play MKV on Mac computer like Macbook Air/Pro, iMac etc. The best DVD ripper review compares top 3 DVD ripping software for Mac and PC and details on how to rip DVD to Mac, Windows Media Player, AVI, MP4, H264, MPEG4, MKV, MOV, WMV for your phones, tablets and game consoles. Wanna convert MKV to MP4 on Mac OS X? While stay on the page and you will get a good MKV to MP4 video converter for Mac (El Capitan and macOS Sierra included), helping you convert video from MKV to MP4 with ease. This article will show you a powerful DVD to MPEG converter for Mac, which is specially designed for Mac users to convert DVD to MPEG with high quality and fast speed. MacX DVD Ripper Pro is the best DVD ripper which can freely rip and convert any new copy-protected DVDs to various video formats (MP4, MOV, MKV, AVI, FLV, etc) and portable devices with original quality.